Get on the bus! 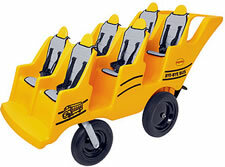 This fun, themed buggy lets kids ride high in their very own school bus. It comes equipped with fat tires, to maximize protection and bump absorption. The Bye-Bye Bus is 27-3/4 inches wide, perfect for fitting through standard-sized doorways (which are typically 30 inches wide). Please note that the Bus is’ only available in a 6-seat model (for 4-seat Angeles buggies, please see our classic red Bye-Bye Buggies). Your Bye-Bye Bus has a variety of standard features that show you once again why Angeles is the leader in transport vehicles for small children. So, those are the important points. 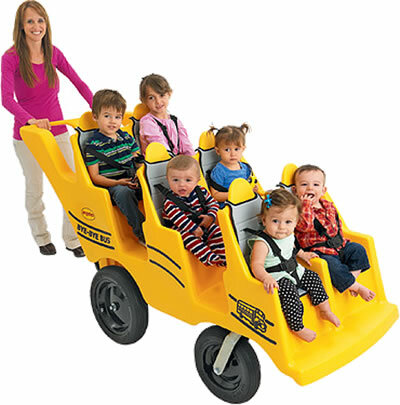 In other words, the Angeles Bye-Bye Bus gives you all the strength and durability of the classic Bye-Bye Buggy, but with a fun school-bus theme that children will love. The Bye-Bye Bus is also available with a large storage cover, and optional sun canopies for each seat.